Manchester City reduced the gap between themselves and Premier League leaders Liverpool to four points thanks to a straightforward win over a gritty ten man Wolves side. City took the lead through Gabriel Jesus' finish from Leroy Sane's cross after a brilliant pass from Aymeric Laporte before the Brazilian doubled the hosts' lead with a penalty following Ryan Bennett's foul. Wolves' attempt to get anything from the game was made virtually impossible when Willy Boly was sent off in the 19th minute for a lunging tackle on Bernardo Silva. The scoring was completed in the second half when Conor Coady turned in substitute Kevin De Bruyne's cross. Check out 90min's roundup of the game below. A disappointing Christmas period, which saw them lose to Crystal Palace and Leicester in consecutive games, had punctured City's hopes of securing another Premier League crown. 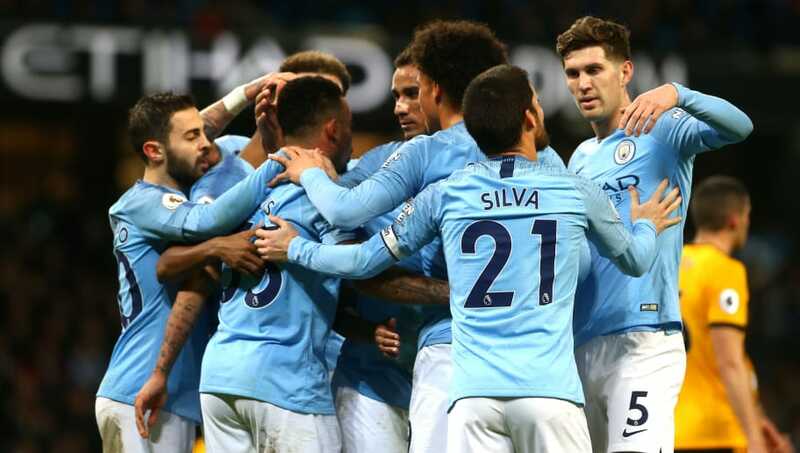 But Pep Guardiola's side are back in form following emphatic cup wins against Rotherham and Burton and while Monday's performance lacked the usual ruthlessness in front of goal, City ran out winners thanks to a professional victory over Nuno Espirito Santo's stubborn Wolves. They'll be sterner tests, matches they can't afford to slip up in if they are to overhaul Liverpool's lead at the top of the table, but City have certainly shaken off any rust they showed during the hectic festive schedule. Starting XI: Ederson (6); Walker (7), Laporte (7), Stones (7), Danilo (7); David Silva (6), Fernandinho (7), Bernardo Silva (7); Sterling (7), Jesus (9), Sane (8). Substitutes: De Bruyne (6), Gundogan (6), Aguero (6). STAR MAN - Competing with Sergio Aguero for a starting position is perhaps the very definition of 'healthy competition', but Gabriel Jesus has shown he's more than up to the task in recent weeks. His double on Monday took his tally to seven goals in his last three games, so there's no doubt that he's currently the man in possession of ​City's striker role. WORST PLAYER - There was no standout poor performer from City on Monday. David Silva misplaced a few passes before being hooked in the 62nd minute and Ederson didn't have a save to make, but every Citizens player performed exactly how Guardiola would have wanted. ​Wanderers have already proven they can hold their own against the league's best sides, notably securing a draw against City in the reverse fixture earlier this season and beating Tottenham at Wembley in late December. However, playing the reigning champions at the Etihad was always going to be a tricky task and their mission was made a whole lot more difficult by Boly's red card for a poor challenge on Bernardo Silva. Wolves will ultimately take some positives from the game, having defended really well for the vast majority of the match despite City's man advantage. Starting XI: Patricio (6); Bennett (5), Coady (5), Boly (2); Doherty (6), Dendoncker (6), Moutinho (6), Neves (6); Jimenez (5), Jota (5). Substitutes: Traore (6), Saiss (5), Gibbs-White (5). STAR MAN - Adam Traore looked bright following his introduction from the bench, but that's pretty much as good as it got for the visitors. Leander Dondoncker showed his versatility after dropping into defence and should be given a run of games in the team following Boly's red card. WORST PLAYER - No surprises here. Boly was on the pitch for 19 minutes, saw his side go a goal down and then got sent off. Not a great night's work for the 27-year-old. Manchester City have an away trip to currently manager-less Huddersfield on Sunday to look forward to before the second leg of their Carabao Cup semi final against Burton. Wolves host Leicester in Saturday's early kick off before they continue their FA Cup campaign when they face either Shrewsbury or Stoke.